Recommended by numerous people to visit this winery’s tasting room during my visit to Sonoma, I can't say enough about how great the reds were which I tasted. Rich & Joan Little along with Joan's brother Tom make the wine and manage the vineyards. They’ve all done a wonderful job of turning out some great varietals such as; Zinfandel, Syrah, Cabernet Sauvignon and 2 blends to name a few. Since 2002 when their first vintage was released you’d never know in such a short time that they weren't making wine for over 20+ years. I was fortunate to meet Rich who is a musician (as I am) and he loves to record in his studio on property. He has a CD with his band although I didn’t get a listen. You can buy it on their website or at the winery along with all their wines. You won’t find these wines at many retailers so visit littlevineyards.com and join their wine club or just buy whatever you'd like. With notes of ripe red berries and a spicy peppery hint, this wine would go great with a pasta bolognese sauce or grilled meats. The taste had a great mouth feel with firm acidity yet no harsh tannins. I would consider this a medium body wine with flavors of black cherry and spicy pepper. The finish was paired with toasty oak and a subtle hint of cocoa. 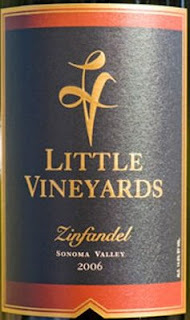 Predominantly Zinfandel (at 93%), the blend also has 4% Syrah and 3% Petite Sirah. With only 125 cases made, this is a bottle you can enjoy now or benefit from short term aging (1 - 3 years).